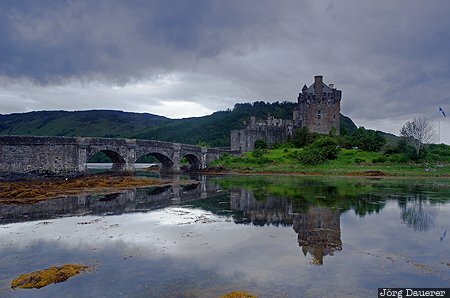 The iconic Eilean Donan Castle and its reflexions in the calm water of Loch Duich below a dark clouds in front of the green hills of the Highlands. Loch Duich is in Scotland, United Kingdom. This photo was taken in the morning of a cloudy day in June of 2013. This photo was taken with a digital camera.